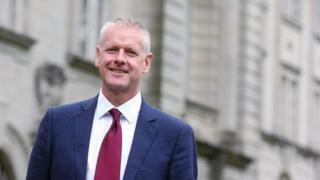 Image caption Prof Colin Riordan says the "decision-making process in our political system seems to have broken down"
The head of Cardiff University has called for a two-year delay to the UK's departure from the European Union. In a letter to staff, vice-chancellor Prof Colin Riordan said it was time for the UK Parliament to acknowledge a no-deal Brexit "would be intolerable". He added the "decision-making process in our political system seems to have broken down". His letter follows a call by more than 250 staff members for the university to back another EU referendum. Prof Riordan said a two-year extension to the Brexit talks "would allow time for the existing Parliament to debate and put to the vote a range of options for agreement other than the existing deal or no deal at all, or to hold a second referendum, or to hold a general election." He wrote on Thursday: "I can barely believe that as I write this email at the end of February 2019, with little more than a month to go before the UK is scheduled to leave the European Union, we are still at an impasse on Brexit. "The decision-making process in our political system seems to have broken down, and not even our own government is able to tell us whether we will or will not be having to deal with a series of major disruptive issues in a few short weeks. "So far as Cardiff University is concerned, we now have detailed plans for the main problems that we can predict might arise from a failure to reach an agreement and from the very sudden termination of long-standing legal processes and agreements. "There is no question though that having to actuate those plans would be deeply unpalatable and expensive." Wales will have received more than £5bn in so-called EU structural funds by 2020. That will end once the UK leaves the EU. The UK government has promised to establish a new UK "Shared Prosperity Fund" to replace the EU funding system. A full consultation on the new fund has yet to be published, despite a promise for it to be introduced before the end of 2018. Prof Riordan's letter added European funding had provided "many millions of pounds of research and infrastructure support" for the university. He added: "While the Treasury has guaranteed in the event of no deal to fund Horizon 2020 research projects and Erasmus agreements that have been signed by the time we leave, no commitment has been given to fund replacements for either of these programmes ahead of the Comprehensive Spending Review due to take place this year, which would leave a considerable funding and organisational gap both for international research and student mobility." The prime minister decided on Tuesday to allow MPs a vote on delaying the UK's departure from the EU, or ruling out a no-deal Brexit, if they again reject the withdrawal deal she has negotiated with the European Union. The UK is scheduled to leave the EU on 29 March - with or without a deal - but that could be delayed if Theresa May fails to get her deal through Parliament in a vote due to take place on or before 12 March.